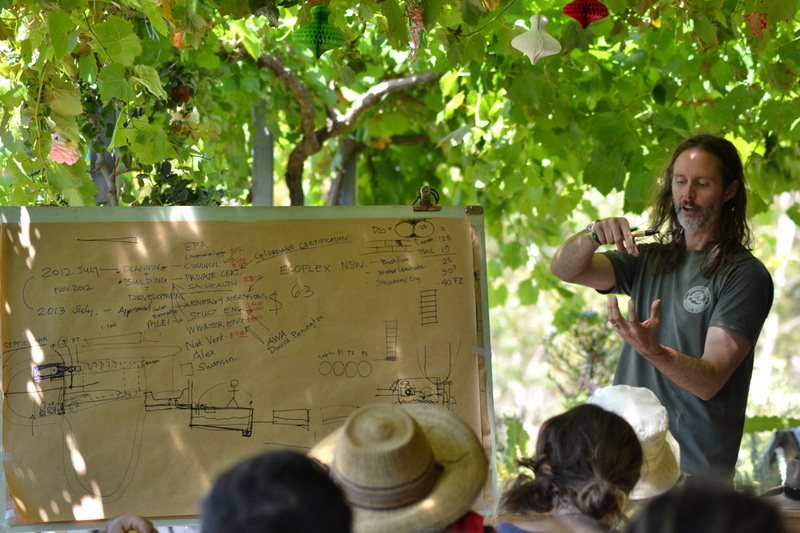 These weekend workshops are designed to introduce you to the Earthship design principles and construction techniques using the Earthship Ironbank project as a teaching tool and venue. 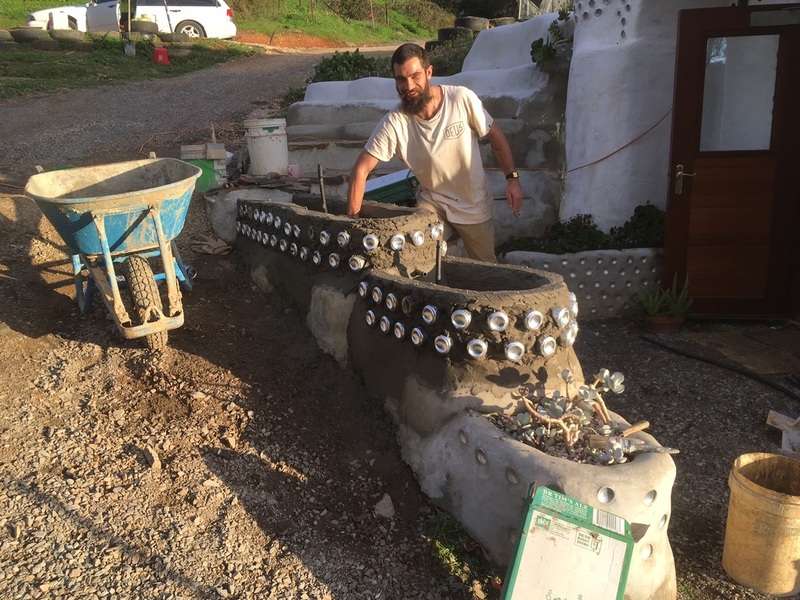 In just one weekend you will learn how to build tyre walls, pack out tyre walls, apply render to tyre walls, make bottle bricks, and you will learn about the theory and principles of Earthship design and construction as well as gain an insight in the process of gaining council approval, and the process of building "the ship", costs, etc. You will also meet other like minded souls who might become life long friends and help you build your Earthship! And you'll get to experience an Earthship and get a feel for what they are like to live in: feel the amazingly stable temperature and food producing indoor garden. If you are interested in natural building, permaculture, sustainable architecture, or sustainable living, then these workshops are for you. Earthship Ironbank is Australia's first council approved Earthship project which has demonstrated that this type of construction method is compliant with the National Construction Code and is therefore valid right across Australia. As it is a Bed and Breakfast it has been through a more stringent assessment and approval process than a regular home, therefore Earthship homes right across Australia are now a possibility thanks to this pioneering project. There is free camping available on site which you are strongly encouraged to use to avoid transport hassles and ensure you are able to participate in the evening activities and be ready for the early morning starts. ​Earthship Ironbank is located at the Freney Family's property at 462 Ironbank Road, Ironbank (50m east of Cherry Gardens Road intersection). It's about a 30-40min drive from the Adelaide CBD. On google maps search for "Lot 100 Ironbank Road, Ironbank" or simply "Earthship Ironbank" and that will accurately find our block. It's four acres, half cleared, half heritage listed native bush land full of Aussie wildlife: koalas, kangaroos, bandicoots, snakes, spiders, wedge tail eagles, possums, fairy wrens, black cockatoo. On that note, please leave your pets at home. Furthermore we have two alpacas (part of our weed and bushfire management system), two toy poodles (part of Zoe's entertainment system) and a flock of chooks, all of which don't respond well to other pets on site. ​There is no public transport, however we may be able to pick you up from nearby towns of Stirling, Crafers, or Blackwood which all have good public transport from the city. Just give us a call ahead of time to get something organised... someone else coming to the workshop might be able to pick you up on their way. Martin Freney is the designer/owner-builder of Earthship Ironbank. 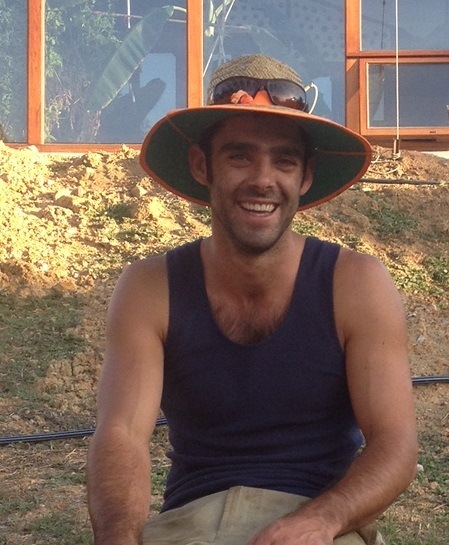 He teaches sustainable design at the University of South Australia and recently completed his PhD which investigated the thermal performance and environmental impacts of Earthships compared to other housing types. He has traveled to Taos New Mexico USA, the home of Earthships, twice, first in 2008 to do the Earthship Biotecture Internship and again in 2011 to install temperature/humidity logging devices in six Earthships and interview Earthship occupants as part of his PhD studies. Earthship Ironbank is credited as the first Earthship in Australia "sanctioned" by Michael Reynolds of Earthship Biotecture USA and also the first approved by a council in Australia. His business, Earthship Eco Homes, is a consultancy for Earthship design; assisting people with plans and advice to make their Earthship dreams become a reality. Sam Tregenza started his Earthship adventure in Montana USA as an intern with Earthship Biotecture in 2013. Since then he has worked on Earthships in South Australia (Earthship Ironbank), NSW (Well Grounded), Tasmania, New Zealand, British Columbia, Arizona, and New Mexico where he did the Earthship Biotecture Academy. He is now the owner and operator of Earth n Tyre, Australia's first and only rammed earth tyre wall construction business. Charles Swain, his love for aquaponics led Charles to Earthship Ironbank where he discovered a new path called earthshipperry. Charles then traveled to New Mexico where he attended the Earthship Biotecture Academy program and has worked on earthships in South Australia (Earthship Ironbank), NSW (Well Grounded), and Tasmania.